New chapters of the young pros auxiliary emerge across the country to bolster the mission of The Salvation Army. It’s halftime of the NFL’s nationally televised Thanksgiving Day matchup between the Dallas Cowboys and Carolina Panthers at AT&T Stadium, so both teams head to the locker room to rest up for the final two quarters. For Meredith Counce, it’s showtime. She’s spent months planning The Salvation Army’s annual Red Kettle Kick-Off Halftime Show to make sure one message gets out: The Salvation Army is a worthy cause, and you can get involved. As director of brand and strategy for the Cowboys, Counce coordinates the event each year, securing talent from Selena Gomez to Kenny Chesney—all in effort to amplify this memo to the millions of Americans watching at home. But if you ask Counce, there’s one demographic in particular that needs to hear this message loud and clear: Millennials. As donor bases dwindle for nonprofits across the country and the number of organizations vying for public support surges, many face a conundrum. How can they hook Millennials—their best shot at long-term sustainability—and keep them hooked for years to come? For The Salvation Army, a large part of the effort lies in a national initiative called Echelon. 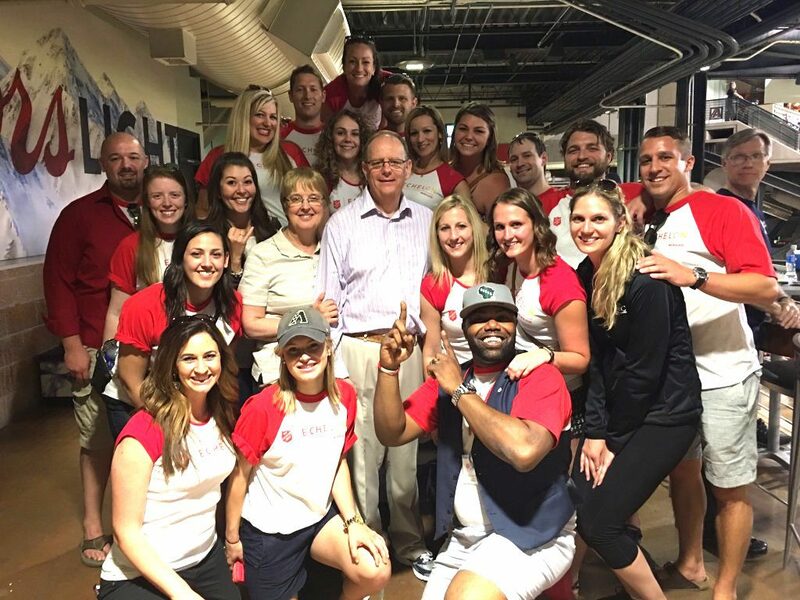 Think young professionals—ages 22-35—fundraising, volunteering, networking, advocating for The Salvation Army in their communities. 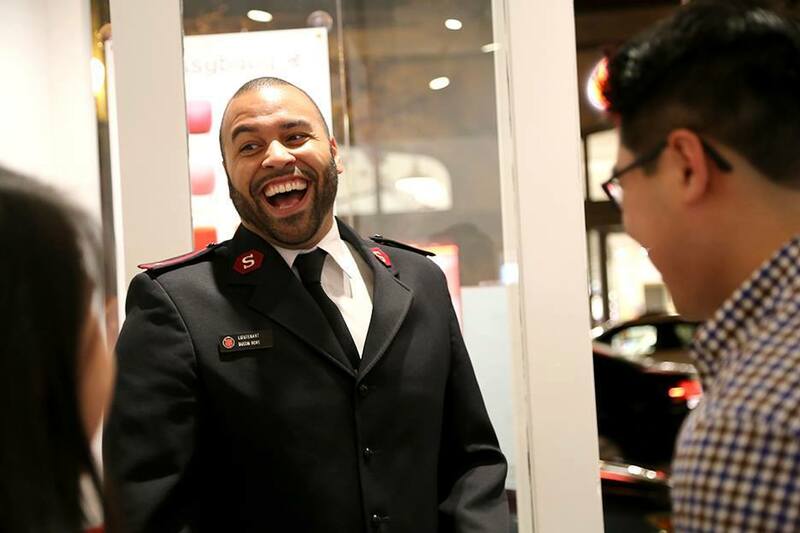 According to Captain Keith Maynor, national young adult secretary for The Salvation Army, even if most Millennials won’t be making $5,000 donations anytime soon, the time to start building trust is now. Millennials are the fastest-growing share of today’s workforce. Unsurprisingly, they are likewise the fastest-growing segment of volunteers and prospective donors. Also noteworthy, the 2014 Millennial Impact Report suggested that Millennials respond best when offered a multitude of ways to engage in a cause, and regard donating their skills and time to a cause as equivalent to monetary giving. Lt. Dustin Rowe, divisional youth secretary for the Golden State division, jokes with members of Echelon San Francisco at the chapter’s launch event in February. That realization came to light when the National Advisory Board (NAB) discovered several years ago that the average age of a U.S. donor was well over 65. Focus groups indicated that Millennials were generally unfamiliar with The Salvation Army. Some didn’t even recognize it was a charity. The NAB subsequently formed a young adult task force to do just that, and the conversation quickly shifted to the need for young ambassadors, ideally family members of existing advisory board members. Counce, whose aunt served on the Dallas Fort-Worth Advisory Board, helped form a junior women’s auxiliary in Dallas, which soon became a co-ed young adult auxiliary. Within six months, that group exploded to 300 members. And in spring 2012, with help from the Richards Group, they developed the name Echelon—a military term meaning “formation of troops.” The NAB approved Echelon as a national brand for The Salvation Army, and the need to scale up the model grew apparent. “This was not just a need here in Dallas,” Counce said. “This was a need across the country…Echelon is really a catch-all, and it’s a great entry point for a young adult to be introduced to The Salvation Army.” But as she soon learned, it’s one thing to make the introduction and another to convey the breadth and depth of an organization working in 127 countries and serving everyone from domestic violence victims to first responders to unemployed vets. It’s a prodigious story, and Echelon needed to tell it strategically for the message to stick. So, instead of frontloading their new recruits, they divided the message into themed “semesters,” each reflecting one specific area of The Salvation Army’s service—women’s services, holidays and substance abuse, to name a few. “Our service events, our social events, our networking, our financial giving and our in-kind giving are all rolled up into one theme each semester,” Counce said. In one project, for instance, the chapter partnered with Green Works, The Salvation Army Dallas-Fort Worth Metroplex Command’s in-house landscape management company, which uses workers hired from the nearby Carr P. Collins Social Service Center. Some of these men are recovering from addiction, some are veterans, but all are homeless, unemployed and hard-pressed to find work elsewhere. After Echelon members learned that there were more men at the shelter than there were positions with Green Works, they committed $25,000 for Green Works to purchase additional lawn care equipment to grow the business and employ more men. They later met some of the residents and learned that, despite their new job experience, they lacked the means to produce a resume to hand out to employers. So, Echelon rallied a group of volunteers one Saturday morning, paired up with the men at the facility, and helped them craft their resumes from the ground up. When they learned that many of the men lacked professional attire for a job interview, the chapter then organized a professional clothing drive, and several members donated suits and ties to make sure the residents felt confident heading into their interviews. Counce said every time they host an event, someone approaches her to tell her how surprised they were to learn of another facet of The Salvation Army’s ministry. Sometimes, that “someone” is an official member. Then, there’s what Counce calls “the fellowship element.” If Millennials aren’t aware that The Salvation Army is a charity, it’s probably safe to assume they’re not aware it’s a church, either. “The Salvation Army being a church is intriguing to a lot of young adults that are wanting to have that [spiritual] fulfillment,” she said. 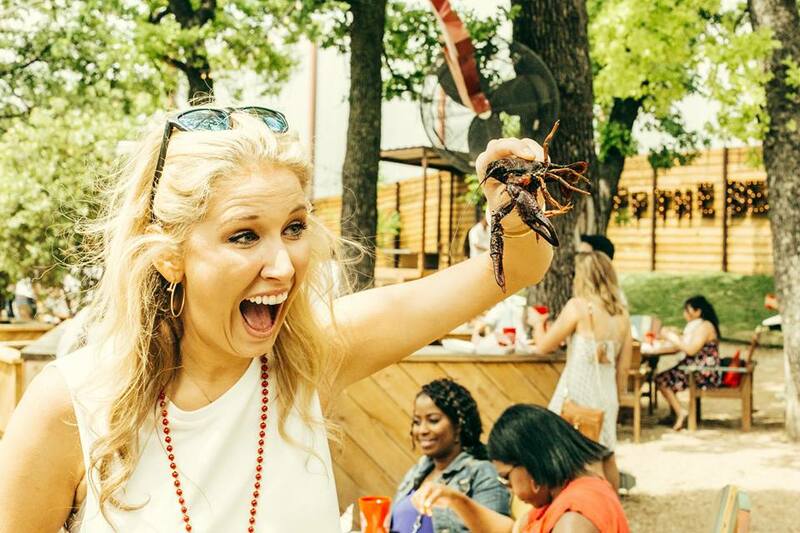 Echelon DFW Co-founder and President Meredith Counce at the chapter’s second annual Uptown Crawfish Boil in Dallas, Texas. The Dallas-Fort Worth (DFW) chapter recently eclipsed $1 million in total funds raised, and young professionals across the country have taken note. Nine other cities—Phoenix, Portland, St. Louis, Milwaukee, Wisc. ; Peoria, Ill.; Louisville, Ky.; San Diego, Honolulu, and most recently, San Francisco—have now launched Echelon chapters. Total membership nationwide has swelled to roughly 1,500 young adults, and at least 15 more chapters are currently in the works, according to Maynor. Counce said she’s enjoyed watching how each new chapter functions uniquely to the community it serves, and how that parallels The Salvation Army itself. From happy hours to fanciful galas to summer camp carnivals, Echelon’s variety of opportunities allows for more individuals to get involved in a way that’s conducive—and fun—to them. Lt. Caroline Rowe, youth and candidate secretary for the Golden State Division, said she describes Echelon to potential members as “half-fun, half-work.” Rowe helped recruit the San Francisco chapter’s vice president and chair of events through a young adult event hosted by the local Chamber of Commerce. She’s also sparked interest in many other up-and-coming Millennials through email pitches. But let’s not forget, Millennials don’t just want to recite the company line—they want to get their hands dirty. Rowe noted that in her previous appointment as Modesto (Calif.) corps officer, many of the local advisory board members had the money to give, but didn’t necessarily want to be the ones decorating and setting up for the fundraising events. Or for that matter, running a public relations campaign or building a Facebook page. Members of the Echelon MKE (Milwaukee) chapter pose with The Salvation Army’s international leaders, General André Cox and Commissioner Silvia Cox, at April’s National Advisory Organizations Conference in Phoenix, Ariz.
“[Advisory board members] don’t want to do that,” she said. “But that’s exactly what these young people do.” If you need a job done, and you have a group of young, energetic digital natives eager to contribute in a hands-on fashion, it makes too much sense for advisory boards to make use of their Millennial counterparts. Maynor said he conservatively expects 25-30 chapters in the next three years. While it may seem premature, Counce said, she wouldn’t rule out the possibility of overseas expansion, either. Both hope that Echelon becomes a “mainstay” in The Salvation Army.